The Christmas/Birthday celebrations went on for days, much fun was had by all. I tried to write a blog about it a but it was so action packed with many many events that I got writer’s block trying to fit it all in. So forgive me, I will return to it when I have everything in order. Meanwhile, when everyone was dispersing on the Friday after Christmas I jumped on a train to London. It was crowded so I put my bag in the luggage area and squeezed into a seat. Watched the green countryside pass by, listened to happy travelers chatting, heard my neighbor’s ringtone, it was the Islamic Call to Prayer, and arrived at Waterloo Station. Went to grab my bag. It was GONE. Aghh. Ran down the platform checking out all my fellow passengers, I must have looked like a wild crazy person. No one had the bag. Oh this is a problem thinks I. Went back to my compartment and found a train guard, explained my predicament and he says, no problem, that guy has it. The relief. He did have it and told me that someone had taken it by mistake and had handed it in, he was taking it to Lost and Found. I almost danced a jig. Can you imagine? Thought I would save a buck and get the tube. Completely failed to figure out the ticket machine so queued up at the ticket window, with all the other foreign tourists. The shame. Found train, got on and realized I had made another mistake. I had far, far too many clothes on. England, December, I had a coat on and a wool jacket and a jersey and a shirt and a scarf. I was melting. Fortunately it was a short ride and I found an air vent to stand in front of, I received some very strange looks. On to St Pancras and the EuroStar. Went through ticketing, they use QR codes, Security, just like the airport, Immigration into France, he barely looked at me and I was in. Removed coat, jacket and scarf and felt marginally better. My train was soon called, found my seat and off we zoomed. I don’t get bored on trains, there is always something to see out of the window and even when we spent twenty minutes under the Channel I could go to the snack bar for a sandwich. Raced across Northern France at about 180 MPH and arrived in Paris after a very short two hours and fifteen minutes. I savored every minute. 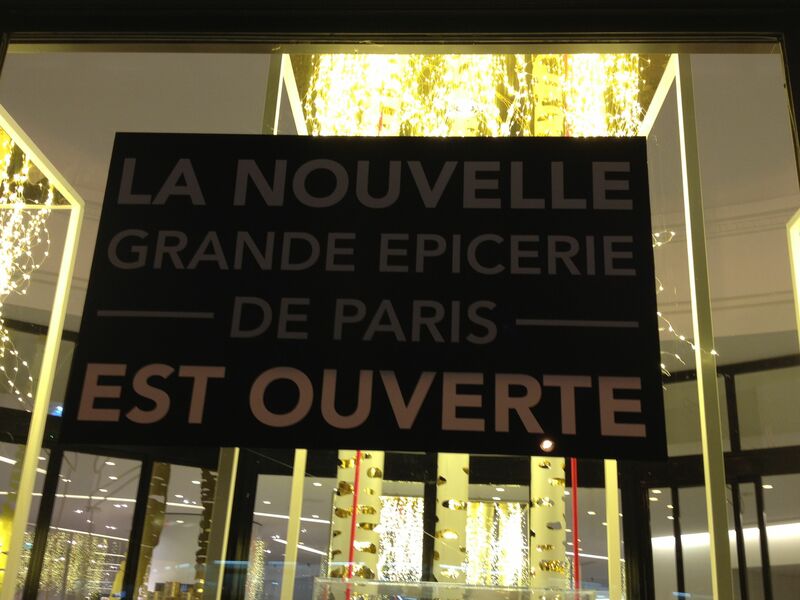 with its new food department, La Grand Epicerie. It was all just as it should be.The hotel was,er, economical. No restaurant, no bar, one English channel on the TV. The room heater was either all on or all off. Extremely hot or freezing cold. I wasn’t too bothered as I didn’t intend staying in it for too long, just sleeping. There was a window, that opened onto the street, a bed and a desk. Reading through the Trip Advisor reviews I can’t help chuckling about the American comments about the size of the shower, yes, it was very small, but it worked. Off out for my first evening in Paris. Went the two blocks to the aforementioned Grand Epicerie and it was truly epic. There is nothing even remotely similar in these parts (Northern California). Harrods Food Hall in London is a good comparison. The cheese section, the bread department, wine area, I was in there for an hour. Right across the street there was a cell/mobile phone shop where after much gesticulating I equipped my phone with a French SIM. I was connected again. Relief. Found a friendly looking cafe with an awning over the outside tables to keep the rain off, sat at a table, had a beer and watched Paris go by. It was all very French. My French is elementary, ten years of learning it at school but my accent is appalling, vocabulary sparse but I did ok I thought until they brought me the menu. It was the tourist version, in English. More shame. I had an omelet and lettuce, and red wine. I was in Paris, nothing bothered me. I was having a great time and will continue this tomorrow. 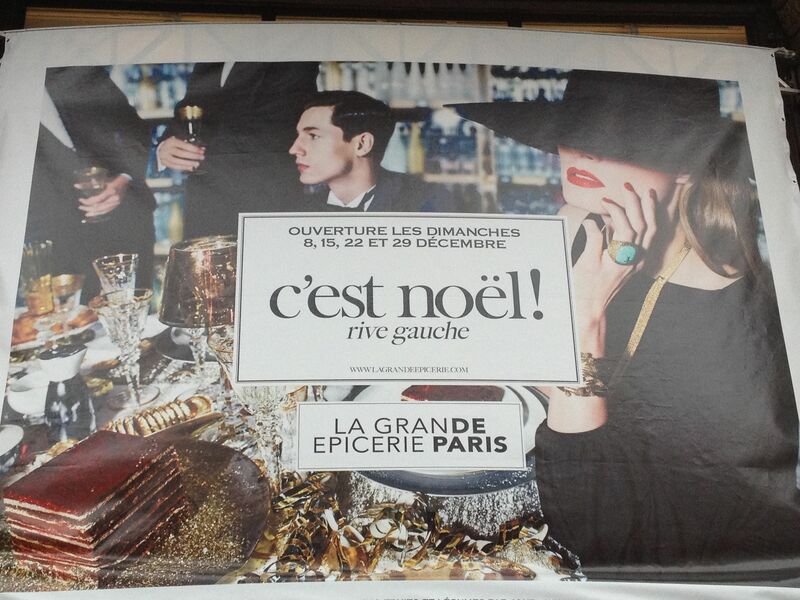 This entry was posted in Uncategorized and tagged Bon Marche, Eurostar, Paris, Saint Germain. Bookmark the permalink. 20 minutes under the English Channel, Tim?! What a modern wonder! I just finished binge watching Philippa Gregory’s “The White Queen,” bout the Cousins’ War/War of the Roses (read all the books, too). That channel was many a fleet’s undoing in bad weather! Have a wonderful time chez Paris! Might have to read those Debbie. Thanks for the tip.